At long last we have reached that prophetic (if not hyped up) year of 2012 so many of us have been awaiting. According to many futurists, this year will mark the beginning of unparalleled expansion of awareness and global consciousness. And based upon the explosion of social media over the past few years — and most especially its evolution in 2011 — we do indeed seem to be ever-increasingly expanding our potential for awareness of our world. How many of our grandparents could possibly have imagined being “friends” with people from every corner of the planet, or having possibly tens of thousands of “followers” who know your name, what you do, and what you stand for? Yes, I’ve heard it all before. Automation is needed to deliver your content. Interaction is needed to build relationships. Learning the balance between these two can be a steep learning curve for many of my new clients. As demonstrated in the previous examples, those that depend upon one and fail to implement the other tend not to reap the results they seek. But what makes the learning curve even more challenging is that to stay on top of things, you need to get used to changing your strategies all the time. This is because the social network platforms themselves (i.e., Twitter, Facebook, etc) are always in a state of evolution, and the plethora of third-party applications available to support these platforms are also always in a state of continual change. Sometimes clients come to me expecting to learn the definitive system for social media. And while I tend to do things in a systematic way for myself, the truth is: there is NO magic “one size fits all” way to “do” social media. Your situation is not the same as mine. Your business is not the same. Your communication style is not the same. Your audience is not the same. Sure, there will be many similarities, but if ANYONE out their claims to be a guru, and tells you they have “the” one-stop solution for your needs, you’d be pretty safe to bet it’s a scam. Don’t spend your money on such claims (I’ve lost more than a few quid on such false promises back when I was a newbie). But the fact that there are so many variables is not the only reason why there is no end-all magic bullet for social media. It is also because all the social media tools out there are all continuously changing, sometimes for the better, sometimes not. And as they change they create a butterfly effect upon each other. So you really have resign yourself to the fact that social media is a fluid system, and that there will be a continual process of learning involved. Even a Rubic Cube is easier to figure out, because the cube is a stable system that doesn’t change. “This is a must read for anyone who wants to simplify the technology of building a platform and creating “raving fans” and supportive friends. Not only is this ebook comprehensive, it is personal—you feel like you are getting the inside scoop from a best friend. Lynn knows her stuff and I especially enjoyed reading the history of her personal experience from using each of the tools. Social Media Tools – Which are best for me? “Like many bookish, word-centric types, I am not naturally attracted to social media’s many techno-centric, third-party apps that allow you to speed up your Twitter management process, and bulk-feed useful information to your followers. I tend to prefer the simpler, slower approach: going directly to each SM site and responding to followers from there. But Lynn Serafinn’s new book changed my mind. Not only does it demystify five of the main automating apps, it includes many not-so-problem-free experiences that the author has had with most (thereby winning my complete confidence — because of her complete honesty). Brilliantly, I think, Serafinn ensured excellent balance in reviewing these auto-apps by creating a three-part evaluation process — listing the “Nice” qualities, the “Necessary” qualities, and the “Nightmarish” . . . results. So you, as a result, learn exactly what to avoid, what aspects of each to circumvent with a judicious SM two-step, and what to more or less wholeheartedly embrace…one of the most useful aspects of this book, for me at least, is a smattering of social-media-app stories (both Serafinn’s own stories and those of her clients) that help to illustrate how SM apps can be used successfully with quite astonishing results. ‘As a business mentor and a serial entrepreneur, it is important that I stay on top of the latest marketing tools and strategies. I also believe in simplifying and streamlining your life as much as possible. 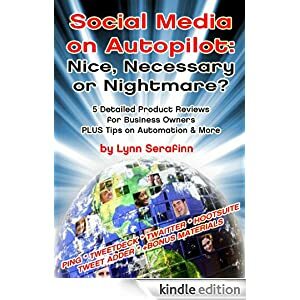 What Lynn Serafinn has done with her new book, Social Media on Autopilot, is truly genius. Not only has she saved me hours of time to learn all of these great social media tools, but she clearly explains how to keep an authentic connection with your followers and potential clients, which is very important to me. And, in Lynn’s great writing style and entertaining sense of humor, she gives us the Nice and Nightmare insights so we know what to expect. In Social Media on Autopilot: Nice, Necessary or Nightmare? [Kindle edition], I bring you 5 details product reviews intended for business owners on five of today’s most popular social media applications: Ping, TweetDeck, Twaitter, HootSuite and Tweet Adder. Each product is evaluated on virtually every feature it offers, and ranked in terms of its usefulness, reliability, automation capabilities, interaction capability and mobility. Accessible reading even for the “newbie”, this report and help you find out how the pros use Twitter, Facebook and other social networks without selling their souls or spending every waking hour at their computer. 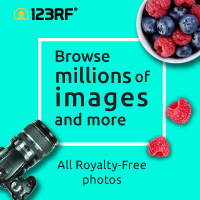 At the end of this report, you will also find some useful bonus materials covering options for integrating your media, and some ideas for using social media apps on your mobile phone. I have helped dozens of authors and online business owners reach the top of their field through social media. Nearly all my learning has come the “hard way” by spending countless hours at my desk, trying to find products and figure out what was best. For a mere $2.99, this detailed report (at 15,770 words, it would have been about 50 pages if I had printed it in paperback format) you save yourself months of research and trial and error. There are even a few free gifts for you at the back of the eBook. I hope you find this booklet useful. If you do, please do come back and leave a comment below (or better yet, post it on Amazon!). Also, if you have any suggestions for eBooks you would like me to write, please let me know that too in the comments below. That would be REALLY helpful to me! And do please subscribe to the Spirit Authors blog for more info and insight into the world of writing, publishing and book promotions. Lynn Serafinn, MAED, CPCC is a certified, award-winning coach and teacher, marketer, social media expert, radio host, speaker and bestselling author. Her eclectic approach to marketing incorporates her vast professional experience in the music industry and the educational sector along with more than two decades of study and practice of the spirituality of India. In her work as a promotional manager she has produced a long list of bestselling mind-body-spirit authors. She is also the creator of Spirit Authors, which offers training, coaching, business-building and inspiration for mind-body-spirit authors, whether established or aspiring. Passionate about re-establishing our connection with the Earth, she supports the work of the Transition Town network in her hometown of Bedford, England. To contact Lynn for coaching, campaign management or media appearances, please fill in the form at http://spiritauthors.com/contact.